So, obviously I'm not a mom, let alone a new mom. 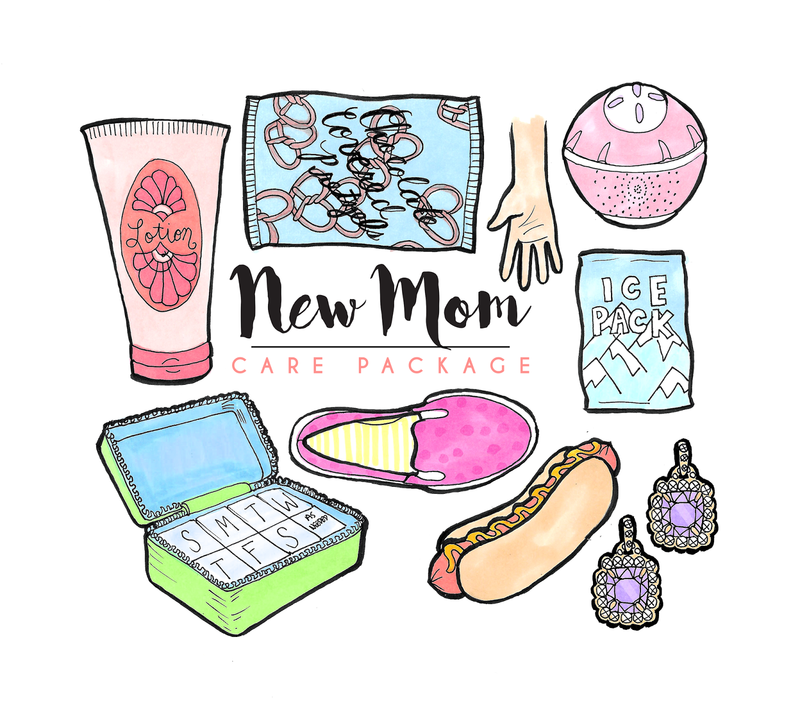 However, I do think that new moms really deserve care packages. This is a huge change for them - whether it's their first baby or their fifth. It's a whole new life they're dealing with. Since I'm not a mom, I asked my sister what would be in a care package she might send. I took her advice and added a couple ideas of my own, and that's how I got today's list. Now, let's discuss...going clockwise from top left. I guess with all the hand washing new moms are doing, they need some lotion. Make sure if you're giving or sending lotion that you get something that's actually moisturizing. I hate when I get a lovely-smelling lotion that makes my skin feel like it needs even more lotion. I'm guessing this is just because this was what my sister was craving. However, chocolate-covered pretzels are pretty great. Sorry you can't really read the text on the illustration. If your girl isn't so much into the chocolate covered pretzels, they can obviously be switched out for her favorite snack so she can munch in the little moments she gets to herself. Just kidding! There wasn't really a good way for me to draw a massage, so I drew a hand. I mean, you should also probably give the new mom a hand with babysitting or cleaning or something, but a massage is what I mean here. Don't give her the massage with your own hands, though. Get her nice, professional one...and then maybe keep the baby while she's there. She might have a sound machine for the new baby, but she also needs one for herself. Sleep is such a coveted commodity for moms that the faster she can go to sleep the happier everyone will be. She's gonna need this. But also...why not include a heating pad or hot water bottle while you're at it. She needs all of the pain relief. New moms might not want to be putting on their favorite pre-pregnancy clothes yet, but earrings always make an outfit more complete. So, if she's still wanting to wear those yoga pants (and who isn't? ), then get her a pair of cute earrings to pull it all together. So, I'm told this was the first thing my sister wanted to eat after she had my youngest niece. You're apparently not allowed hotdogs or deli meat. This means, a nice deli platter of a trip to Nathan's is in order....if she's not a vegetarian. I'm not a mom, and I still generally have no time for shoelaces. Make going out of the house just fractionally easier for the new mom by getting her a pair of comfy slip-ons she won't be embarrassed to wear. So, these are a thing right now. You can purchase them from a wide range of stores and at a bunch of different price points. I have one from Bendel's that was a special treat on my 30th birthday. However, I've seen them at much more reasonable prices. It's nice to get the zip pouch (as pictured here) because then you can throw it in your purse and not worry about the pill lids coming off and dumping into your purse. If they do come open, the worst that could happen would be that they fall out into the pouch. That's not as bad as it could be. Ok! That's all I've got! 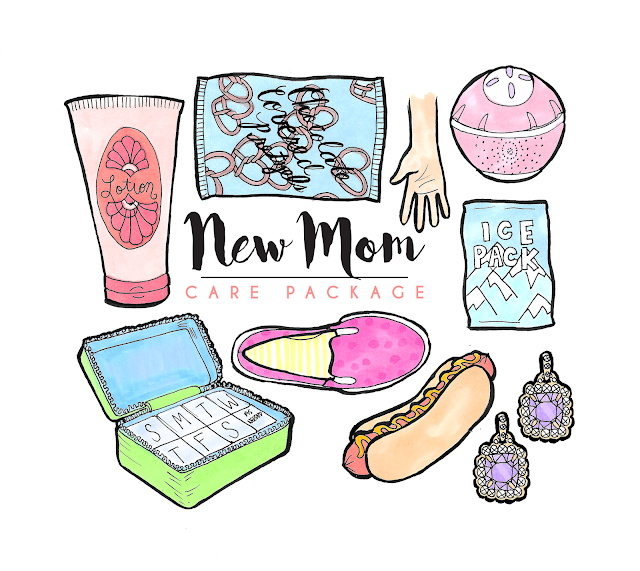 Check in tomorrow for another care package idea. Happy Tuesday!